Many people consider the hymn “Nearer My God, To Thee” so full of trust and aspiration, to be the best ever written hymn to be written by a woman. 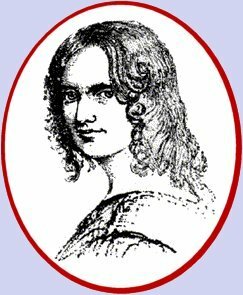 The gifted and romantic author was the daughter of a talented and fearless English journalist, Benjamin Flower. While still a young man, he wrote several articles expressing political views too radical for his times, and as a result, was sentenced to serve six months in a London prison. His friends and political sympathizers did not desert the young liberal at this misfortune, however, but came frequently to his prison to visit him. Among these friends was a young English girl with whom he fell in love, and later married, after his release from prison. Their daughter, Sarah Flower was born to them in 1805. She gave early promise of a brilliant and varied career. The dream of her youth had been to go on the stage, for she believed that drama, as well as the pulpit, could teach religious truths. Her very uncertain health, however, soon forced her to abandon all thought of the stage as a career. Greatly disappointed, at first, she turned her talents to writing, little realizing that in this field was to lie her greatest achievement. On the day of President McKinley’s funeral, September 19, 1901 , this hymn was sung in his memory in countless churches, large and small, all over the land. In England , too, by the order of Kind Edward VII, the hymn was sung at McKinley memorial services held in Westminster Abbey. In the last moments of the Titanic tragedy, on Sunday, April 14, 1912 , the ship’s band played this hymn, while the vessel was slowly sinking after having struck an iceberg on its maiden voyage across the Atlantic . the prayer and perfect trust in these verses have helped men meet the greatest crises of human life. The hymn is a supreme and triumphant expression of the message that even in darkness and trouble we can be lifted nearer to God. Because the hymn has been so often used in times of sadness, we sometimes overlook the real joy it expresses. When you examine the verses of this song, you will realize that it should be sung in times of joy as well as times of sorrow.